I was driving down an unfamiliar road in Durham, when suddenly I found myself in the town of Mayberry–or at least it felt that way when I came upon a rustic old-timey country store. 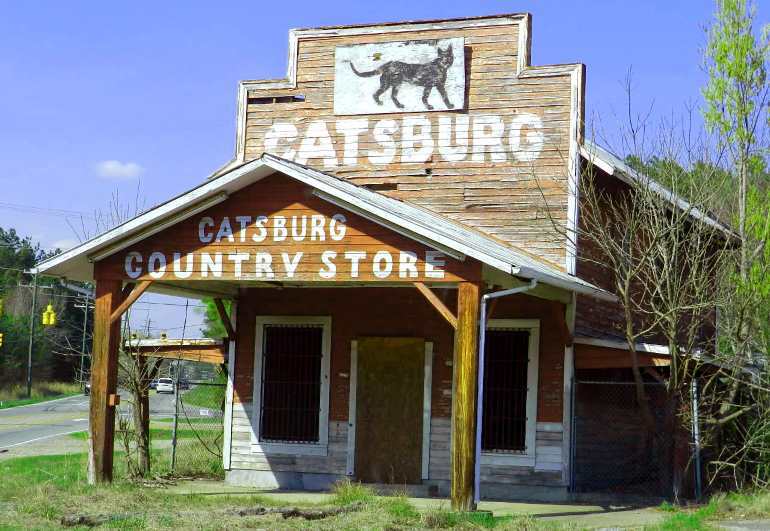 The high false front and gable roof had “Catsburg Country Store” scrawled in white cartoon letters, and a black cat was painted above. Fascinated by this slice of nostalgia, I pulled over to snap some photos. When I got home I turned to Google for research. As it turns out, many photographers have pulled over just like I did, and the Catsburg Country Store is a bit of a local treasure. It has a colorful history. This store is named after a Sheriff Eugene G. Belvin, nicknamed “Cat” for his smooth and easy moves and his slick ability to sneak up on moonshine stills. Of course, other rumors say he was just running off the competition for his own illegal distillery. Love him or hate him, Cat was the longest serving Sheriff in Durham County as of 2012, maintaining law and order from 1930 until 1958. Charismatic and charming, but willing to bend the rules, I’d like to think of him as Durham’s version of Andy Taylor–except I don’t think Andy would have served the Confederate veterans moonshine out of the Town Hall. RELATED: The Ruins of Umstead: Searching For the Lost Homes of Raleigh Families. But the simple life isn’t all that the Catsburg Country Store calls to mind for locals. Cat’s community is built atop a slightly darker history, resting on the grounds of the Stagsville Plantation, one of the most grandiose slave-owning plantations in the South. This massive complex stretched across Durham and Raleigh and was owned by the Bennehan and Cameron families. Yep. Cameron, like Cameron Village. According to comments by locals and an article in the Duke Chronicle, these old grounds have several mysteries that would have scared Opie right back to Mayberry. An old foundation resting in the trees behind the Catsburg Country Store, often unnoticed by tourists and photographers, has drawn attention of locals. 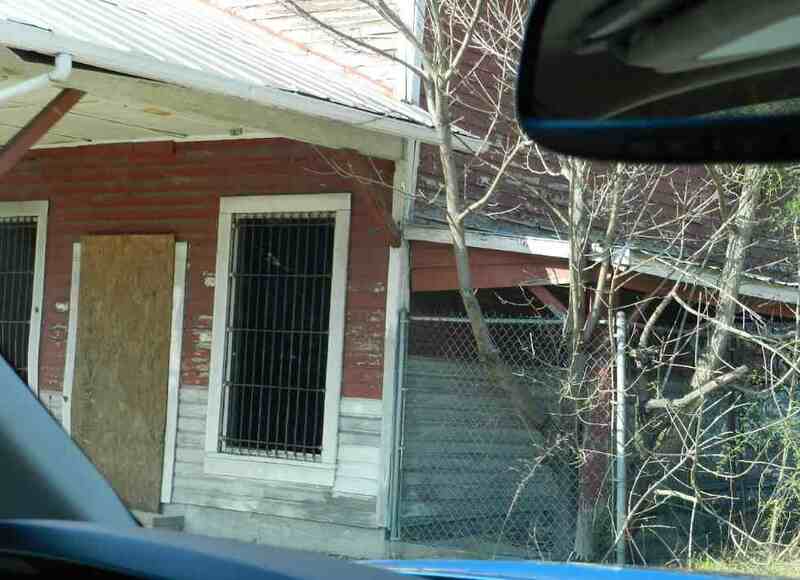 No one is quite sure who used to live in the house that once stood there, though some report a wizened old woman spent many years residing there alone, her story lost to history. And even the Duke Chronicle explores legends of a ghost train that rides along the tracks that run nearby the store. While this area came to life in the 1920’s, with baseball and bubblegum, it’s now a remnant of its former self. 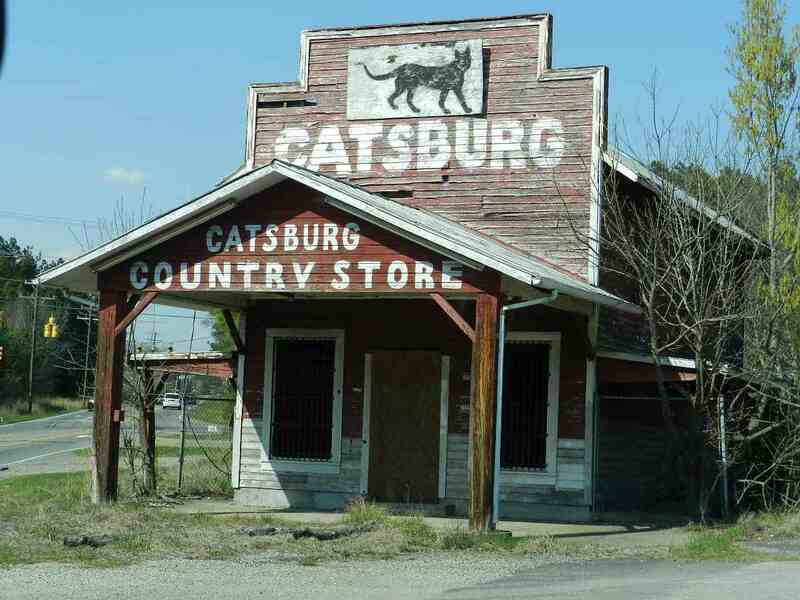 The store continued serving customers until the 1980’s, when Cat’s grandkids finally let the place run into the ground. The current owners have done nothing to fix it up, and Durham residents worry over the future of the little country store. Some people tell stories of a time before cars, when people tied horses to the posts. I found a great bit of history on Open Durham, where people share memories and nostalgia of the crumbling store. RELATED: Fee-Fi-Fo-Fum: The Legend Of The Raleigh Giant. 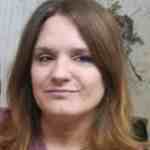 As for me, I still imagine Opie playing over yonder in the baseball field. I really enjoy finding old, abandoned buildings, signs, and statues and taking photographs of them. It makes me think of simpler times.